Banner ads (rectangular ads usually placed along the top or bottom of a site) used to dominate ad slots on blogs and throughout the web but became less important because people often just tuned them out. Then, pop-up, animated, and blinking advertisements generated a few clicks and ultimately managed to generate a massive backlash. Many of these moving, beeping, and blinking ads just irritated users instead of successfully advertising a product or service. Today’s contextual advertising tools are actually intelligent; ads are matched by subject to the words and phrases that you use on your blog. Generally, this approach gives you ads that better suit your readers’ interests, making those readers more likely to click the ads. Does your blog have a design that’s ready for ads? Does your blog software support the advertising system you choose? Will advertising earn you any money? Will your audience put up with ads? Answering these questions isn’t easy; in fact, you might find it impossible unless you jump in. Try using some advertising and observe the results. You can use several kinds of advertising methods to turn a blog into a place where you can make a tidy profit. The last few years have seen an explosion of companies that want a piece of the action in the blogosphere, and these companies have come up with creative ways to make ads easy to use, simple to implement, and appealing to your readers. If you’re a new blogger or just new to advertising programs, you can easily latch onto the first advertising system that you find and commit to using it. Although this system may serve your needs well, you might want to take a look at some of the different ad systems available and find out about how advertising tends to work in the blogosphere before you start using ads. While you do your research, keep in mind that if you decide to make that leap into monetizing your blog, you should choose software that allows you to control your advertising so that it doesn’t overwhelm the blog audience that you worked so hard to build. A multitude of advertising companies offers bloggers simple solutions to monetize websites. Most of these programs work in similar ways but have unique delivery methods. Many bloggers also choose to work with a specific ad network, which serves ads directly to their bloggers’ sites. As a blogger, choosing an advertising program that works for your audience can make the difference between an increase in readers and turning off your existing traffic. Text-based ads: These ads are text-only and feature a link or links to the advertiser’s website or service. Each ad is very plain, and most advertising systems limit your ability to customize their look and feel. Graphical banner and button ads: Banner and button ads can be static or animated images. These ads usually have preset sizes, but you can customize them to fit your blog design. RSS ads: RSS ads can include text or images, and they’re linked to the advertiser’s website straight from your RSS feed. Pop-up ads: Pop-ups tend to be everyone’s least favorite type of ad, but oddly enough, pop-up ads that open in a new window are still quite successful at getting people to click an advertiser’s website. The readers might be fairly irritated by the time they get to the site, but they do click. The Interactive Advertising Bureau makes recommendations each year about ad sizes and standards. You might find the recommendations useful in planning for ads. Visit http://www.iab.net/guidelines/508676/508767/displayguidelines to see the options. Most ad programs today — with the exception of sponsorships — use contextual advertising, which coordinates ad display with related editorial content. So, a blog post about skiing might include ads for ski shops and resorts. A blogger who posts about blogging, for example, ends up with ads for blog software and tools. Contextual ad systems search your blog for keywords that match products the advertisers have in their inventory. These ads then appear beside the topic keywords and, in theory, apply in the context of the web page on which they appear. 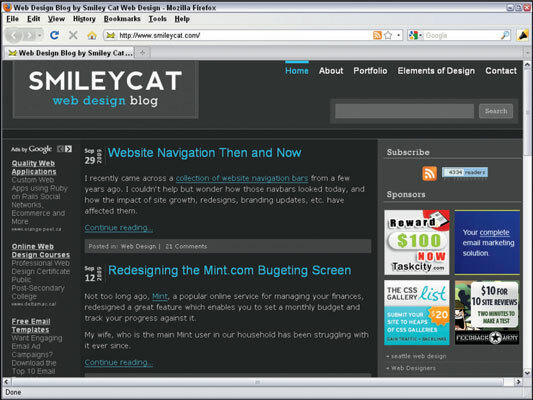 Contextual ads about blog polling tools appear on the left side of the Smiley Cat Web Design blog. Cost per impression: In this model, advertisers pay for the number of times a computer loads a page that displays the ad. The advertiser might prefer that a reader click its ad, but it recognizes that simply appearing on a blog that users access also has value. Cost per click or pay per click: The blogger makes money only when a reader clicks an ad and goes to the advertiser’s website. This type of ad is very common in contextual ad programs, as well as on search engines in the sponsored results section. Cost per action: The advertiser pays only when the reader actually takes action after he or she views and clicks the ad on the blog. This required action can include anything from signing up to receive more information to actually purchasing a product. Sponsorships: When an advertiser wants to be actively associated with the content of your blog, it might offer to sponsor the blog or some part of the blog. A sponsorship usually includes premium advertisements and exclusive ad placement, and the blogger sometimes even thanks the sponsor in the editorial content of the site. A lot of bloggers have had the same great idea about the ads on their blogs: “I’ll just click these myself and send my cost-per-click rates through the roof! I’ll make millions!” Unfortunately, the advertising companies have figured out this little scheme, and they refer to it as click fraud. Make sure that you understand what happens if you click ads on your own blog before you do it: Some programs penalize or even ban bloggers who engage in click fraud.